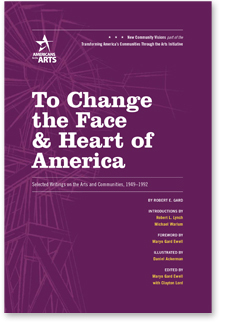 To Change the Face and Heart of America, a collection of writings by Robert E. Gard, celebrates the 50th anniversary of one of Gard's seminal texts, The Arts In the Small Community. In this unique collection, Gard’s daughter, Maryo Gard Ewell, collects 50 years of Gard’s writings into a set of 10 beautiful, simple, profound meditations upon the value of the arts in communities. Gard’s words are as resonant now as when they were first written and exhort all Americans to “change the face and the heart of America” through the arts. Speaking across time, the visionary artist and advocate Robert E. Gard, one of the founders of the local arts movement, reminds us that healthy, vibrant, equitable communities are not possible without arts and culture.